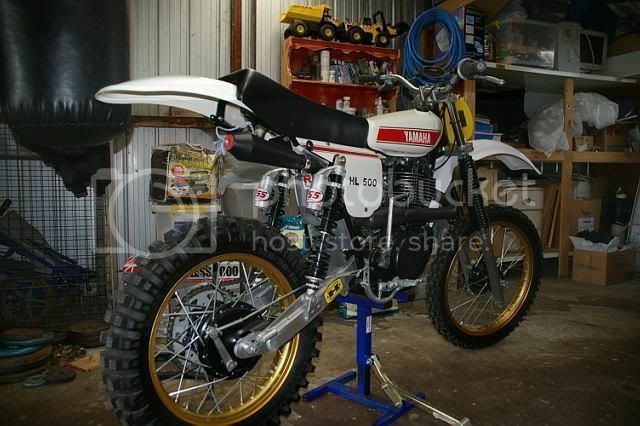 Just wondering how many owners of XT/TT500's and their different variants (HL's etc) are out there? I've got a 76 as a pre 78 race bike, a 79 that will be for pre 80 and another 76 that will end up as a trail bike. All have different forks, swingarms, wheels etc to standard. Sorry, no 500's here. Only a couple of 550's. Got one going (XT500 77 model), and a few in bits. I have an old xt500 that I'm doing up to cruise the back roads and dirt tracks around here on sundays. tt600 disc brake wheels and forks,klx swingarm,skinny/fat enduro tank. Thanks, Brent ,for all the info you sent. Tony, 550's are included, especially project bikes. Remember the one for sale a while ago with YZ465 plastics and running gear, niiiiiiiiice. Roger, glad to help, I think I'll post the XT stuff here. Now that I've worked out how to post piccies here's a couple of mine.